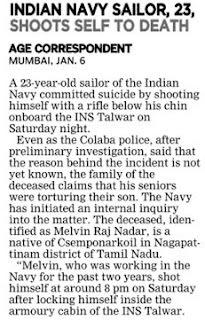 A 23-year-old sailor of the Indian Navy allegedly committed suicide on board a frontline warship last night even as his family suspected foul play behind the incident. Melvin Raj, hailing from Tamil Nadu, was found with a gunshot wound on his head on board INS Talwar anchored at dry dock here. He was rushed to INS Ashwini naval hospital, but was declared dead on arrival, police said. Melvin's family, however, alleged foul play behind the incident and claimed that the victim was being harassed by his seniors since several months. 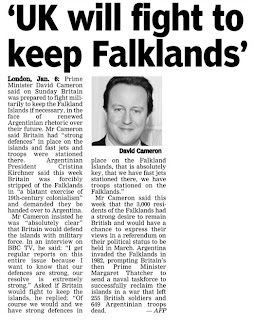 His family also alleged that the sailor had complained about not being granted leave. The naval authorities have ordered an enquiry into the incident. "A Board of Enquiry has been ordered into the family's allegations. Once we receive the report, further course of action will be decided," Ministry of Defence PRO Narendra Vispute said. Even as the manner in which the Ministry of Defence has gone about in implementing the Supreme Court order on anomalies pertaining to rank pay consequent to the Fourth Pay Commission has kicked up a fresh controversy, the government will start paying arrears for the same from this month. A communiqué issued by the Principal Controller of Defence Accounts, Pune, states that payment of arrears to serving Army officers affected by the aforementioned judgement would be made along with the salary for January 2013. Where affected officers have retired from service, the payment of arrears will be made from first week of February 2013 onwards, after due verification of requisite details of residential address, bankers, PAN and pension payment orders. The orders affect officers holding the ranks of captain to brigadier as on January 1, 1986. Sources in the defence accounts department said the determination of arrears is a “complex exercise” and the arrears for each individual would be different depending upon the dates of promotions and period of service. There is no common formula that could be applied across the board. The instructions to implement the Supreme Court judgement were issued by the MoD last month, following which veterans pointed out a twist in the instructions that makes the apex court’s orders largely redundant. The Supreme Court had in 2010 ruled that rank pay, first introduced by the Fourth Pay Commission, is to be included as part of basic pay for the purpose of calculating emoluments, allowances and benefits. Contrary to the recommendations, the orders issued for implementation of the Fourth Pay Commission had deducted rank pay from basic pay, causing financial loss to officers. India has received firm indications from China that the new leadership of the Communist Party would give the highest priority to maintaining peace and tranquility along the border between the two countries. Informed sources said Beijing was keen to continue with the current upward trajectory in bilateral ties under the new leadership and would also try to address India’s concern over the yawning trade gap between the two countries. China’s new Communist Party leader Xi Jinping will formally take over as President in early March when the country's legislature opens to elect the leaders at various levels. Later in March, Xi is expected to hold bilateral talks with Prime Minister Manmohan Singh on the margins of the BRICS Summit to be held in South Africa. Sources said that New Delhi was hopeful that Manmohan Singh would be able to establish the same kind of rapport with the new Chinese leader that he had developed with the outgoing President Hu Jintao and Premier Wen Jiabao. Amid the ongoing leadership transition in Beijing, the two countries would seek to maintain momentum in their bilateral ties through some high-profile engagements in the coming weeks. National Security Adviser Shivshankar Menon will meet China’s State Councillor Dai Bingguo on the sidelines of the meeting of the NSAs of BRICS countries here next week. This will be the last meeting between Menon and Dai, the Special Representatives (SRs) of the two nations for talks on the border dispute, as China is expected to have a new SR in view of the change in the Communist Party leadership. The discussions are expected to cover a spectrum of bilateral issues. Dates for the next round of boundary talks may also be decided at the meeting. Dai’s visit will be followed by the India-China annual defence dialogue on January 14-15 when Defence Secretary Shashi Kant Sharma travels to Beijing. Minister of State in the Prime Minister's Office V Narayanaswamy is also expected to visit China at the same time. The Karnataka High Court has cleared the way for an Army officer of the rank of a Major to marry a foreign national, after directing the Army to relieve him from duty. Major Vikas Kumar wanted to marry Arnila Gunaratne, a student from Sri Lanka, but faced objection from the Army which contended that he must obtain government sanction before marrying a foreign citizen. Speaking to NDTV, Ms Gunaratne,, who is set to marry Vikas Kumar in February, recounted the long road to the altar. Srinagar: Pakistani troops today violated ceasefire by firing mortar shells towards Indian army posts in Uri sector near the Line of Control. Villagers near Churunda village in south Jhelum sector had some anxious moments after firing started around 3.15 am. 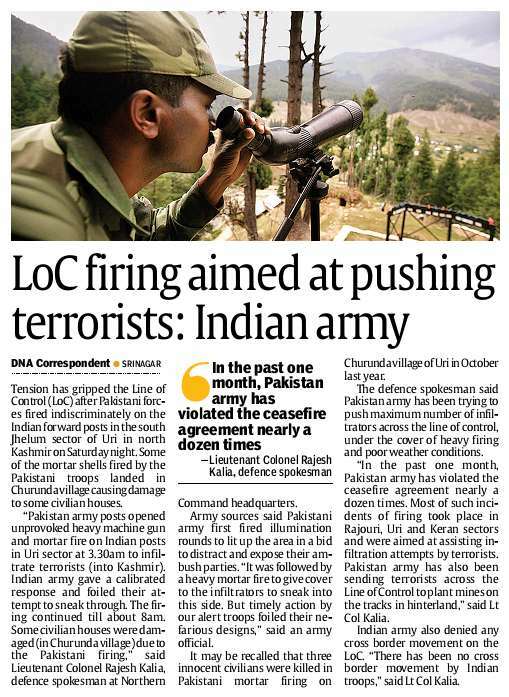 Army troops guarding the borderline retaliated which forced the Pakistani troop to stop firing. Panick has gripped the villagers who feared casualties and damage to property as last time. “They (Pakistan army) started firing mortar shells towards our posts at Churunda village in Uri sector around 3.15am,” an army spokesman said. He said some of the shells landed close to civilian habitation but there was no damage done. The spokesman said the army retaliated the Pakistani shelling briefly after which there has been quiet from both sides. UPA is all set to take another look at the controversial Armed Forces Special Powers Act (AFSPA), armed with a devastating critique of the law by IDSA. The Institute for Defence Studies and Analyses, the government's premier think tank, has concluded in a blistering appraisal report, that "status quo is no longer acceptable". It suggests major changes, or the replacement of AFSPA — the law that gives sweeping powers to the Centre's counter-insurgency forces — by a more acceptable law. The law is in force in Jammu & Kashmir and the Northeast. India's military leadership is opposed to any change in the law, which gives the forces legal basis to conduct counter-insurgency operations on the country's troubled frontiers. 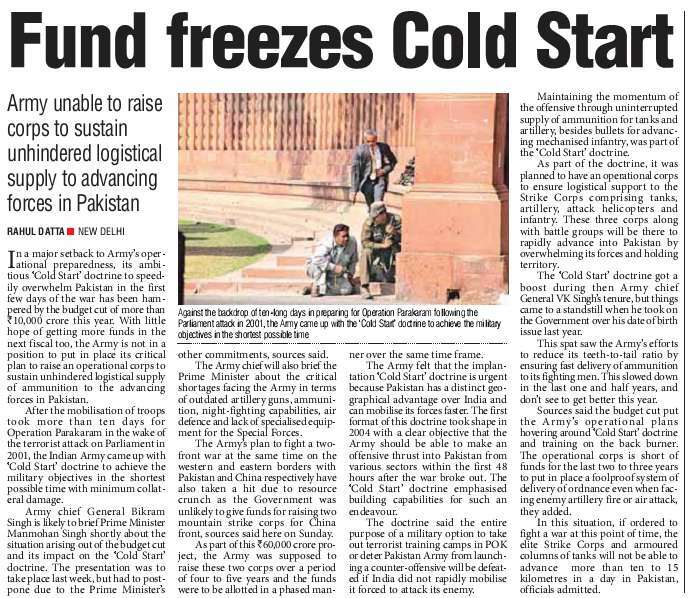 The military brass insists that repeal or dilution will compromise India's war against cross-border terrorism. The UPA government has so far been treading cautiously on this sensitive issue, not wanting to be seen as overruling the military on a national security issue. 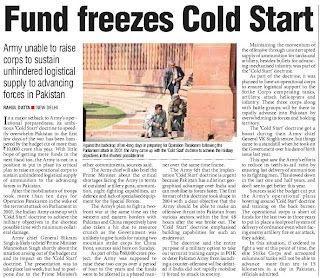 But the stunning anti-AFSPA blow by the government's defence and strategic affairs think tank reflects the view widely gaining ground in the establishment that the law has now become a political liability. The IDSA warns of "the danger of AFSPA becoming a symbol of (state) oppression", and goes on to state that "continued deploymnent of AFSPA in its present is only deepening the divide between the people and the Army". The report is a rebuke of the Army's anti-change position, suggesting that the demand for change "should have come from the Army, whose good work is being undone by the ghost of AFSPA that continues to haunt the present with the baggage of the past", and that it's "in the interest of the Government that AFSPA changes". Recently-retired Home Secretary G.K. Pillai, who is also associated with the report, says the "anti-people" image of this law, enacted as an enabler to fight proxy wars, should not be ignored. "There's a public perception that AFSPA is anti-people and gives the armed forces licence to act with impunity and commit human rights violations without accountability," he says, adding that stonewalling by the forces even in clear cases of rights abuse strengthens the perception. 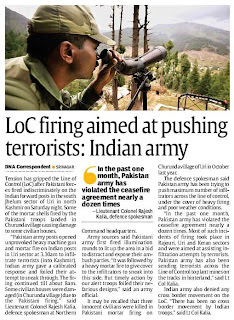 Sources reveal to The Sunday Guardian that the Army tried to scuttle the report, which is ironically edited by a highly-rated, recently retired Army officer. But the Army's opposition to the AFSPA study was overruled by Defence Minister A.K. Antony, in a clear signal that the UPA is open to review. There are far-reaching recommendations to "civilise" military policing. Foremost among them is that the principle of use of minimum force be made part of the law, which takes away a lot of discretion from local commanders and addresses concerns over excessive use of force. AFSPA in its present form authorises the Army, CRPF and the BSF to shoot to kill in areas declared disturbed, to arrest and search without warrant and provides the forces immunity from prosecution. The law gives discretion to virtually all ranks of the Army to open fire even to disperse any assembly of five or more persons. Veteran Kashmir hand Wajahat Habibullah holds the view that AFSPA, which overrides common law and the safeguards in the Code of Criminal Procedure, can be held to be in violation of the right to life. 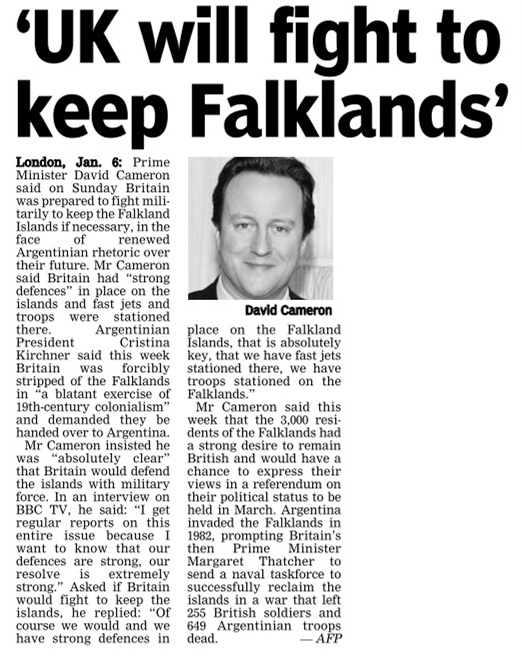 While conceding the final say to the armed forces, he wants safeguards to be written in the text of the law. The Dos and Don'ts reiterated suggest that no operation be carried out by the Army or Central forces without the involvement or knowledge of the civilian government, and that no woman be searched by troops, and that detailed records be maintained of all operations, including the names of all personnel involved in the operation. These guidelines also forbid the torture of persons arrested by the Army. What has raised the hackles of human rights groups is that permission to prosecute personnel for alleged offences has never been given by the Central government. The IDSA report seeks time-bound investigations into all human rights complaints, reasons for delay explained and the status put on websites. Failure to prosecute high-profile cases of excesses like the Machhil killings of 2010 have added to the anti-AFSPA chorus. 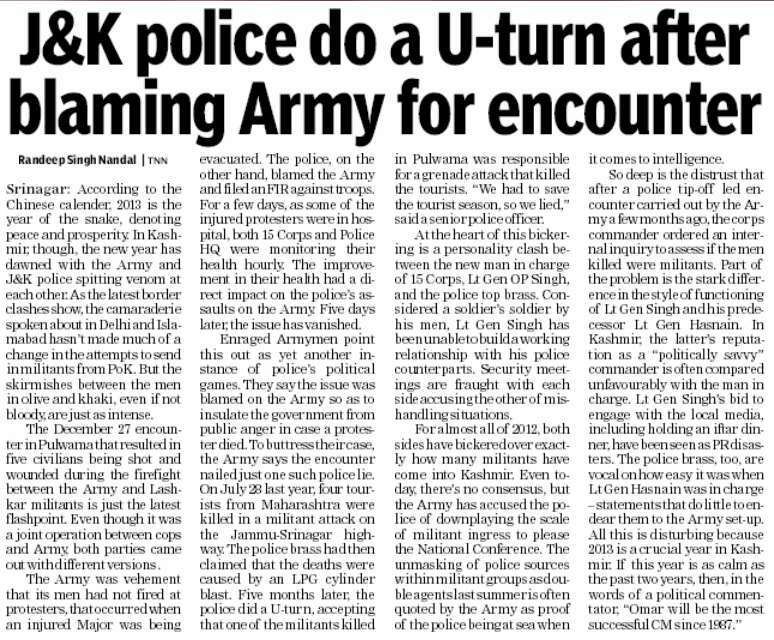 The report is also an indictment of the indefinite deployment of the Army for internal security. "I'm firmly of the view that in a democracy, Army must be employed for a limited period... 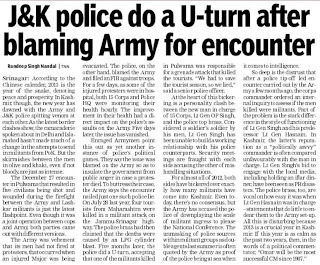 Unfortunately, it's just the opposite in practice," rues Pillai, who describes indefinite dependence on Army deployment in disturbed areas as "an alibi for poor governance and the failure of the government to enforce law and order." Srinagar, Jan 6: Dismissing reports about any raid on a Pakistani checkpost, the Army today averred that its personnel were forced to react to a "ceasefire violation" but no one crossed the border. Earlier, the Pakistani military released a statement that Indian soldiers "physically raided a checkpost named Sawan Patra" near the Haji Pir Pass. Claiming that the attackers left behind weapons at the border post, the statement mentioned the death of one Pakistani soldier and serious injury to another in the skirmish. However, the Associated Press quoted Army spokesman Colonel Brijesh Pandey as saying that after Pakistani troops "initiated unprovoked firing", "We retaliated only using small arms." Mortar shells fired from across the border destroyed the home of a civilian, the colonel said. "We believe it was clearly an attempt on their part to facilitate infiltration of militants," he added. His colleague Colonel Jagadish Dahiya stressed that "None of our troops crossed the Line of Control." He also told Reuters that "We have no casualties or injuries." The current ceasefire in Jammu and Kashmir came into effect in 2003. India has charged Pakistan with violating it whenever there is a major infiltration along the LoC. Delhi believes Islamabad deliberately creates trouble in order to divert attention so that militants can sneak in without hindrance. Pakistan's refusal to accept Kashmir's accession to India (in Oct 1947) is the root of the problem. Due to this, both sides had to deploy a large number of troops in terrain that is mostly inhospitable. The deep-rooted hostility between India and Pakistan means that the Siachen glacier continues to be the highest battleground in the world. Last month, an avalanche in the glacier's Turtuk area claimed six lives. All the deceased belonged to the 1-ASSAM Regiment. As many as 144 Pakistanis including 14 civilians were similarly buried under a wall of snow on Apr 7, 2012.